There’s a lot of information and research out there on exogenous ketones, protein powders and exercise. Here are the simple stripped down facts. First, let’s decide what the word workout means to you because that really is the most important factor. Then consuming exogenous ketones is probably not your best first choice. In fact, that is exactly the type of exercise (anaerobic) that causes the muscle tissue to look for sugars. Carbohydrates ready to convert to glycogen. Protein to convert to glycogen. Fructose- to be converted to glycogen. Each of these types of sugars can only be processed by increasing insulin production. Bodybuilder? Grab a piece of fruit before you lift weights. You will have the best chance of giving your body the glycogen it will be craving. Yes, protein powders can be a good second choice, particularly if you are bodybuilding or burning extreme calories as a fitness professional. We have Keto Pre specifically to help us. Most of the KetoCredible customers are not bodybuilders or weight lifters. Keto Pre was designed by Irina Litchfield when she noticed that her body was beginning to change. After her professional ballet career ended and her daughter arrived she found she was not exercising 7 hours a day like she used to. Like millions of women, she found her exercise in walks, spin classes and aerobics. 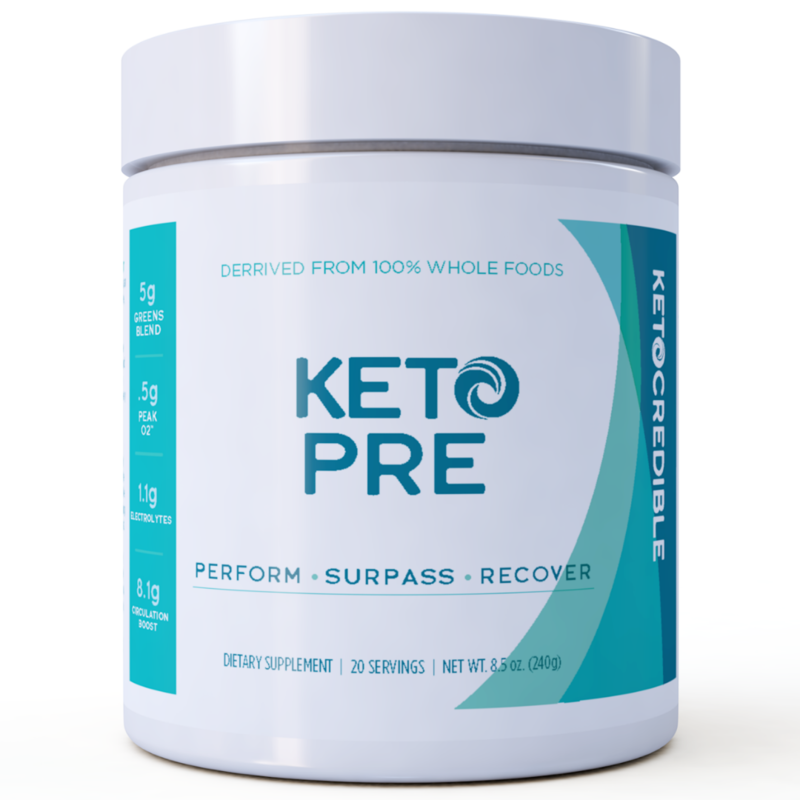 Keto Pre was formulated to help energize and keep your body in ketosis without carbs and extra proteins. Is Keto Pre For You? If you are doing moderate aerobic exercise for over 10-15 minutes up to 2 hours...then Keto Pre is fo you. If you are a walker, a runner, a cyclist or your exercise is more of a consistent burn then you will appreciate the Keto-Pre. It was designed to give your body what it’s needing and expecting for these activities. More sustained energy for a person on a ketogenic diet. Exogenous ketones have been studied and the conclusion is that they provide both energy and endurance for you. You will find your desire and energy to exercise increase. You will avoid the tiredness that is often associated with starting a carb free life as your body gets off the “sugar train”. In fact, exogenous ketones will help curb your sugar cravings and satiate appetite. Your body will eventually start accessing stored fat after exercise...which means that those extra pounds will literally melt away. That’s right…hours after you stop exercising…even when you sleep it is possible to fuel your body on stored fat. Pass up that protein bar or that protein powder before you take your daily walk, jog or cycle…even your aerobics class. Instead, have a glass of “Pre” to increase and extend your energy like endurance athletes. Say yes to a few satiating and energizing ketones.